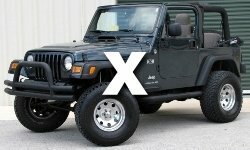 This page is dedicated to showing the various trim packages that were available from the factory for the 2005 Jeep Wrangler. However we have also dedicated specific pages to the four main trim packages listed below. Click on the image to learn more about the specific trim level. 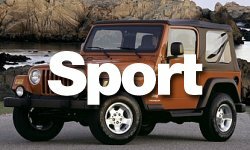 Continue reading to learn more about special edition trim packages that were available during the 2005 model year. The Rocky Mountain Edition was a limited run that was basically an SE trim package with various upgrades, the largest being a Dana 44 rear axle. It was only available in black, silver, red, yellow and blue with matching color fender flares. Other amenities included a specific wheel/tire packages, interior accents, upgraded 7 speaker system, fog lamps and of course the Rock Mountain special decal (shown left). 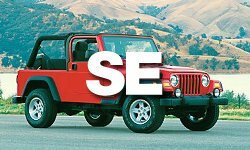 Possibly the most rare Wrangler, the Sahara Edition Unlimited Rubicon was only available for model year 2005 and only 1,000 total units were produced total. These visually unique Sahara / Rubicon Combo Unlimited Jeeps were built to coincide with the theatrical release of the movie Sahara which extensively featured a Jeep Wrangler. The Willys Edition TJ is another rare edition which similar to the Rocky Mountain Edition above features unique styling and accents. This includes a green military theme with a moss green paint job matching fender flares, green diamond plate rocker guards, camo seats and dark green soft top. Other amenities include a CD player and 7 speaker sound system, fog lamps, and unique decals.